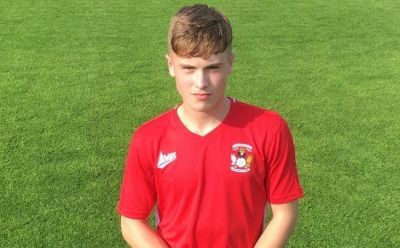 Manchester United have signed highly rated teenager, Charlie McCann from Coventry City after impressing United manager Jose Mourinho and the club’s scouts. The Red Devils had to beat neighbours Manchester City to his signature, McCann was called up to the England U-16 team to make his debut earlier this summer. The 15-year-old was one of the hottest prospects in the Sky Bet League Two club’s academy. The highly rated starlet has been with his boyhood club at the age of seven, and will complete a move to Old Trafford after a compensation fee was agreed between both parties. “When a big football club come knocking, and it is the club that Charlie supports, you must let him go and have that experience. “We did not want to sell him, we did not need a fee for him even though there was a fee involved.”Charlie goes with complete support from me and the rest of the staff from the academy.” he added. Manchester United have been bringing in talented youngsters into their academy recently, over the past few months having signed Ethan Galbraith, Aliou Badara Traore and Arnau Puigmal. Puigmal is the pick of the bunch of all four, he was brought in from Spanish side academy Espanyol before joining he Red Devils. He has been tipped has the next best thing to come out from United’s academy.